Thanks for being patient with me, it’s been a crazy couple of weeks!! I hope you enjoy this weeks blog! As I was scrolling through Facebook last week I came across a post by one of the Mormon apostles Jeffery R. Holland. It talked about having difficult times in our lives and referred to something written by John Taylor quoting Joseph Smith. Holland went on to say that we have to suffer just as Christ suffered. He stated that when Christ was in the garden he was in agony and “We must walk where He walked”. I’m not exactly sure where Mr. Holland was going with this whole thing but what I got from it is that we are meant to suffer. God puts difficulties in our lives to see how strong we are and if we can’t handle the pain and trials in life then we aren’t worthy of being in the presence of God. I know that life is hard. I have had difficult times in my life and weathered many storms. However, I don’t think that God ever wants us to suffer or be in agony. I know that God challenges us or wants us to grow. But most often when I am in a situation where I am in agony or my heartstrings are being pulled that hard it is because of my choices. Sometimes there are things that happen in life that are really hard to understand, that happen not because of our choices but maybe because of someone else s, or just because. This is one thing I struggle with often. When someone I love is diagnosed with cancer or another chronic illness, it’s hard to understand. No one chooses cancer, diabetes, depression, anxiety, etc. or when you lose a loved one in a car accident. It’s difficult and it’s hard to understand. The thing that helps me the most to gain some perspective on this is, thinking back to the garden of Eden and Eve eating the apple. When she did that, sin and death entered the world and the world began to die. One thing I know for certain is that God is always there. He will never leave me to go through the storms of life alone. And as I have said many times in the past I am never going to be worthy of His presence but that’s why I have a Savior! I was completely baffled by by Mr. Holland’s statement!! “You will have all kinds of trials to pass through…God will feel after you, and He will take hold of you and wrench your very heart strings”. It blows me away to think that my loving God would set out to “wrench my very heart strings” and if I can’t handle it then I am not good enough for Him. It is heartbreaking to think that God would put difficult things in your life, just to see if you were strong enough to handle them. He is going to make things hard and make you struggle and if you give up or you feel like you can’t make it through then you aren’t deserving of being in his presence. The saddest part of that quote is, so often that is a very common theme in Mormonism. If you are in a storm or struggle in your life then God is testing you or you aren’t working hard enough. What it comes down to is that you need to try harder. One quote that I’ve heard or seen often from my Mormon friends is, “The teacher is always quiet during the test”. I have always struggled with that quote. 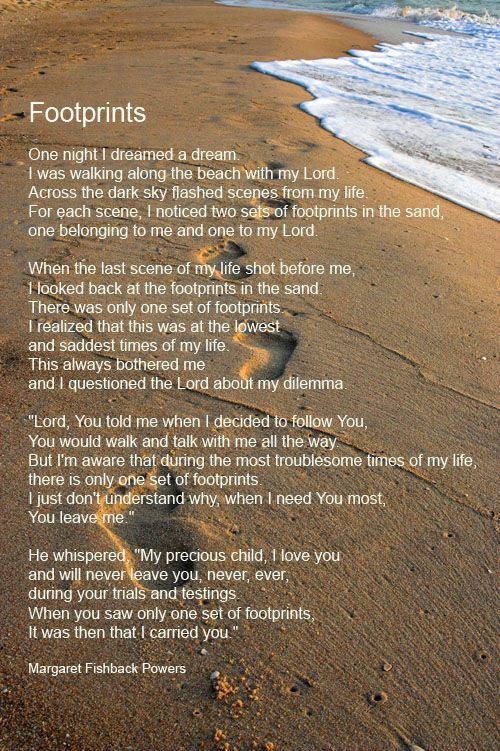 When I see that, I think of the poem Footprints in the Sand. He is always there. Always walking along beside us and more often than not, He is carrying me, especially in my most difficult and darkest times. I also think of the quote that says God won’t give us anything we can’t handle. I think that is the furthest thing from the truth. If God is putting something in my life that I feel I can’t handle it’s because He wants me to rely on Him. He wants to be my strength. It is so I will trust in Him and not in myself. It’s so I will rely on Him! Last week I saw another post that was talking about Philippians 4:13 “I can do all things through Christ who strengthens me.” (ESV). It was talking about how often people misinterpret the passage. In this devotion it talks about if you take the whole passage from Philippians in context the passage isn’t about gaining strength or pushing through hard times. It’s about being content in the moment and relying on God completely in whatever circumstances we face. As a Christian the most important thing I do is rely on God and trust that God is going to take care of me. I don’t have the ability or strength handle or face everything that happens in my life. In fact, there are so many things that I can’t handle, that I struggle to face even on a daily basis. If I thought, for even a second, that I had to do them to prove to my God that I was worthy of Him and His love and presence, I would fail every time. I think I would give up. What is the point of living if you know you can never do enough or be enough. Just the thought of trying to prove myself to God is depressing. I fail Him everyday! What gives me hope is knowing that His word, the Bible, tells me He is my strength. The Bible is full of stories of God taking people that weren’t adequate for the task at hand or who didn’t have the strength and ability to do what He wanted them to do or go through and yet they came out on top. Not because of their strength or ability but because of God’s! Can you imagine David being told by God he would kill a giant! Do you think he didn’t question God. Do you think he could have killed Goliath on his own without God. I know there are times when heart wrenching things happen but I really don’t think that God seeks to do us harm or has a desire for us to be in pain. When I have seen people go through difficult times it is the people who rely on God and trust in Him who seem to be the most resilient in the situation. Overall, God is my strength. He is the one I rely on especially when storms of life are raging. The hardest part is relying on him when the waters of life are calm. I’m just a small town girl…living in a stormy world where Christ is my strength. Don’t forget to check out the music videos for this week!